Your website review contains what? In this article, I’ll explain more about what we address in our website review. That requires a bit of history. For the last 3.5 to 4 years, Joost and I have been sculpting the website reviews into what they are now. We started out writing reports that were focused on both technical and general SEO, and site speed, but found out pretty soon that this just didn’t cover all bases. When we started hiring more and more consultants, every one of those contributed to the recommendations we give our customers today. In this post, I’ll go over all sections of our current Gold SEO reviews. One of the first things that were clear pretty much immediately when we started writing website reviews, was that ugly sites almost never rank well. You can quote me on that. Design, and perhaps even more user experience, are an important part of the holistic SEO approach we recommend. In this section of our website reviews, we address the general appeal of a website. Our consultants have seen their share of websites (we’ve done over a 1.000 reviews, none of those was automated) and we review this from experience and knowledge gathered over the years. This includes checking things like call-to-action, tone of voice and a number of possible accessibility issues like the contrast. But we’ll also see if your 404 page can be improved, for instance. And we’ll obviously recommend against using that slider you still think is useful. If you have been following our website for a certain time now, you’ll have noticed we’re very keen on quality content. With the vast diversity of devices we use to browse websites, the importance of content for any search engine is obvious. It’s the central part of your website, and the rest is decoration (but not too be forgotten, as highlighted among others in the section above). The quality of the main content is determined by how much time, effort, expertise, and talent/skill have gone into the creation of the page. Site content isn’t just about keyword strategy, but also about the content a site uses in a broader spectrum. We take the amount of content per page into account, for instance, and see if we can find any duplicate content. We’ll also try to provide some insights on site structure and use of taxonomies. With our Gold SEO review, we’ll either confirm you’re on the right track, or explain what can be improved and how. We’ve had our share of website review customers that told us their type of business didn’t need social media. It’s simple: if nobody talks about you, you can’t be an authority. Posting stuff about you on Twitter and Facebook is how people talk about you online. This is a vital part of your online marketing these days and every website review should at least mention the use of social media. In our website reviews, we check both your community pages (like your Facebook page) and how you’re using these, and also how you’re using social media on your website. Are share buttons in an obvious spot? Are social buttons easy to find? Just some of the things we check. The main goal is to make you aware of the possibilities and the way you’re leveraging social media marketing for your website. If you’re serious about your website, you’re serious about your template code. Messing this up could literally influence every one of the other sections mentioned in this article. It could mean design can’t be changed that easy, it could mess up perfectly structured content, and it could seriously reduce speed. The template code chapter is mainly about technical optimization. The part we address next is what we call general seo. SEO is dead, right? Well, part of that could be true. I sometimes feel we SEO consultants put the discussion on hold as we have no clue what to call ourselves if SEO is really dead. Website consultant? Digital marketeer? Joost did an awesome presentation on the subject during WordCampNL earlier this year. But there are still some basics that I would call SEO. For now. One of the main ranking factors has always been and perhaps still is the title of a page. You obviously want that branded. You still want canonical URLs to be used in the correct way and your links (backlinks, permalinks and internal links) to be the best they can be. The general SEO section is also where we check sitemaps and meta descriptions, and tell you to stop using those meta keywords. For our Silver SEO reviews, this is the final section. For most of our customers, this is something they’re dying to start with. This is also the section they’re less confident about. “I combined CSS files and my site broke.” You probably heard that one before. Things like compression and browser cache are hard to understand or do for an average website owner. We know a bunch of people that can help you, but also try to explain in layman’s language what these things do and how you, or your host/developer should go about this. Note that some parts of speed optimization are a lot easier when you are using WordPress. If you are that lucky customer that found a decent WordPress developer and are now using the CMS that powers 25% of the web, the Gold SEO review has an extra section for you. In this WordPress section, first we check security. After that, we see what plugins you have installed and what plugins we are missing that could be useful for you. Of course, we don’t know all 40,000+ plugins in the plugin directory at wordpress.org, but we’ve used our share of these and are continuously testing new ones (have you tried WP Rocket? It’s awesome). One very important addition to all the sections listed above, is that we only mention what is relevant for your website. We could easily create a tool that would scrape your website and give you a 300+ checks containing report. But that would be of no use as most of that report would simply not apply to your website. We want to focus on what’s relevant. In that process, we have written recommendations over and over again and found that a lot of these recommendations applied to more than one website. To further reduce our prices for the Silver and Gold SEO reviews, we have templated some of the recommendations. Besides that, we left plenty of room for additional, handwritten recommendations. Sometimes you just want to emphasize certain issues mentioned in the review, or explain where that recommendation is coming from. The end result of all of this is a website review tailored to your website, highlighting all the things you are doing right, and all of the things that can be improved. Two reasons. We are often asked what a Gold SEO review can do for a website. What it contains, and if we can just analyze the technical stuff instead of everything. I hope this post tells you we do not believe in just optimizing one aspect of your website. Use a holistic approach. The second reason is that our website reviews are currently on sale until December 11. There is a $100 discount on the Silver (non-WordPress) and Gold (WordPress) reviews. There is also a whopping $700 discount on our Platinum SEO review (now only $1799), that contains both the Silver or Gold review and a tailor-made analysis of for instance your site’s history and a lot more insights coming from Google Analytics and Google Search Console. 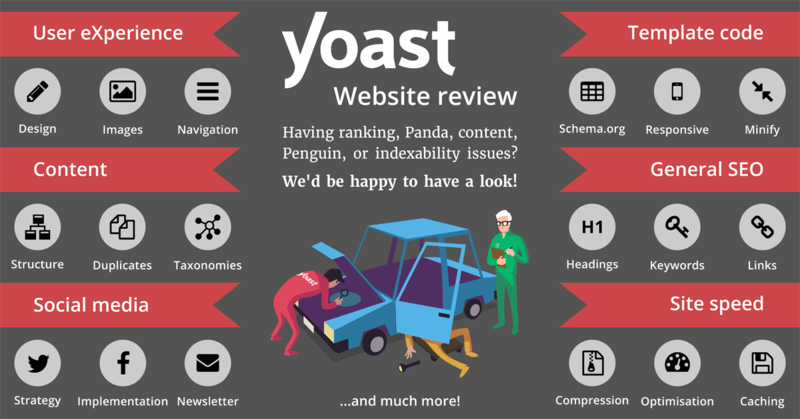 Having ranking/Panda/content/Penguin/indexability issues? We’d be happy to have a look.